Drugs used to treat various rheumatic disorders. The worst of these disorders being rheumatoid arthritis. The cause of the disease is the overcompensation of the body’s attempt to heal the infection which results in damage to its own joints. This disease is the most crippling of them all. Pain, swelling, and stiffness in the joint/joints affected result over a period of time in deformity of those particular joints. Feelings of being unwell, loss of appetite and fatigue also accompany this disease. The treatments for rheumatoid arthritis, which must bring welcome relief to those who suffer, are usually drugs, rest, changes in diet, physiotherapy and restricted use of the joint or joints affected. Although as of yet there is no cure rheumatoid arthritis can and does ease of its own accord for prolonged periods of time. However, flare-ups do happen. Although rheumatoid arthritis does cause the stiffening of joints it does not normally, for most people, result in permanent disability. The end result of the medication is to relieve the pain and stiffness associated with rheumatoid arthritis as well as to enhance mobility and to prevent deformity of the joint/joints affected. There are two structures of medication. The first is to relieve the symptom, while the second works on trying to modify the disease bringing it to a halt or slow down the underlying symptoms of the disease. Prescribing aspirin and other NSAIDs (non-steroidal anti-inflammatory drugs) would be the first line of defence. However, it is possible that these first drugs may not be of any use or the disease is too severe for them to make a difference. If this is so then the second selection of drugs will be used. These type help to prevent further damage to the joint/joints and disability. The second group of drugs is not prescribed according to routine or as an established practice. This is because these drugs have the potential of having severe adverse effects on the person receiving treatment, and it is also possible that the disease may stop extemporaneous ((of its own accord) for a period of time). Chloroquine originally intended to treat malaria can be used. This medication and other related drugs are not as effective as others; such as gold, penicillamine. Prolonged use of chloroquine may cause damage to the eyes, and because of this regular eye checks would be needed. 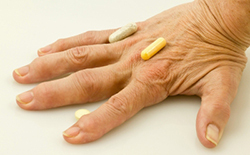 Corticosteroids are also sometimes used to treat rheumatoid arthritis, but only for a limited period of time. This is because these type of drugs work on depressing the immune system, meaning there is an increasing possibility of vulnerability (very little or no defense) to further infection. Other drug groups used are immunosuppressants and gold-based drugs. Hydroxychloroquine and sulfasalazine are also used. The body’s immune system is thought to be partly to blame for the disease, although it is not known exactly how they do work. Immunosuppressants may reduce the effectiveness of the immune system, either by the depressing production of lymphocytes (a type of white blood cell) or by altering how they behave. However, which anti-rheumatic drug to use depends on how each individual (patient) responds to treatment, which, when effective reduces damage to cartilage and bone by preventing/stopping further damage. Treatment with these drugs relieve pain, reduce inflammation and swelling of the joint/joints. In this way, antirheumatic drugs reduce or stop further damage to the affected joint/joints. When immunosuppressants are prescribed for an autoimmune disorder they do reduce symptoms halting the disease temporarily, unfortunately, they can not restore major tissue damage. These type of drugs can be the cause of a variety of secondary effects which may be noticeable for a while before any health benefits are felt. Side effects also vary between individual drugs. It is also possible side effects could become that severe treatment may need to be stopped. However, treatment with antirheumatic drugs over a long period of time can show a marked difference in symptoms relieving pain, promoting increased joint mobility, and that general feeling of not feeling very well. Bringing a much-improved sense of wellness to the sufferer. anti-inflammatory drugs are quickly absorbed by the digestive system and health benefits from them can be felt within one hour of taking. If these types of drug are taken over a long period of time to treat rheumatoid arthritis they do bring about relief from the pain, inflammation, and stiffness bring about much-needed relief for those who suffer. However, NSAIDs (non-steroidal anti-inflammatory) although quick to relieve the pain they are also short-acting and need to be taken a few times a day to keep the symptoms under control. Most NSAIDs bring with them a low risk of side effects such as nausea (feeling sick) indigestion and altered bowel movement which is common to some NSAIDs. There is also a more serious side they can occasionally cause bleeding in the stomach and duodenum (first part of the small intestine). Most NSAIDs are not recommended during pregnancy or breastfeeding. This would also apply to those who suffer from kidney or liver problems where caution would be advised. Caution would also apply if you have a blood disorder or you are already taken drugs that reduce blood clotting.